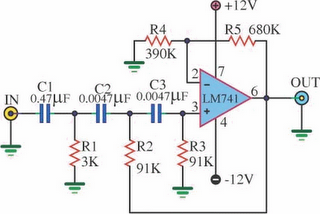 This is active high pass filter circuit for 327Hz frequency using LM741. It will use to build Harmonic at 3 of 130.81 frequency have the value at least. More than the frequency Fundamental 30 dB, for output be sawtooth wave form for use in sound of music way system Electronic design will use the circuit filters three rank frequency. By have 3 dB you slopes can use Op-amp IC number LM741 or number LF351it will meet the frequency well.